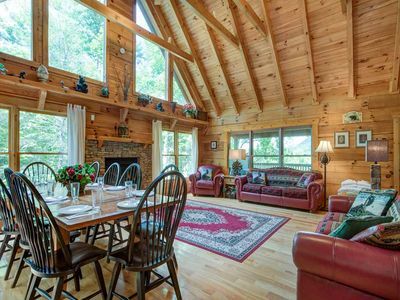 Eastwood is a renewed, classic log cabin with rich pine wood throughout the top two floors. It's the perfect cabin for your family or a large group to come and enjoy the mountains. Eastwood has many new upgrades and plenty of amenities for all to enjoy. The game room with pool table and sitting area are sure to be a big hit with everyone. 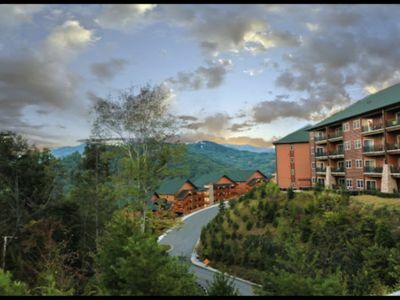 Eastwood is located in the Village of Cobbly Nob Resort, just 10 miles East of Gatlinburg. Town is just a short 15 minute drive. 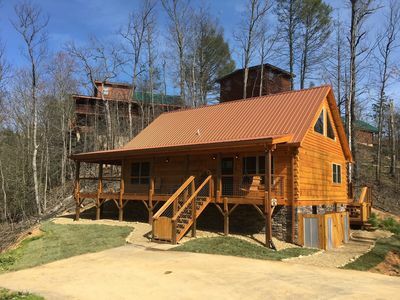 Eastwood is located near other cabins within walking distance if you have a very large group..sleeps 10 and has free WiFi!At Eastwood you will find a real log cabin in Gatlinburg, Tennessee. 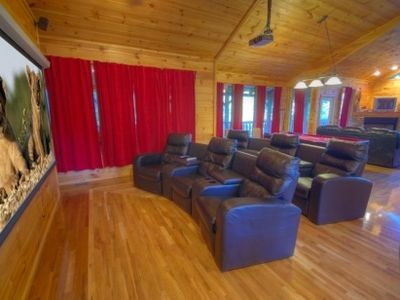 This large cabin has rich pine wood throughout the top two floors and has many new upgrades with plenty of amenities for all to enjoy. 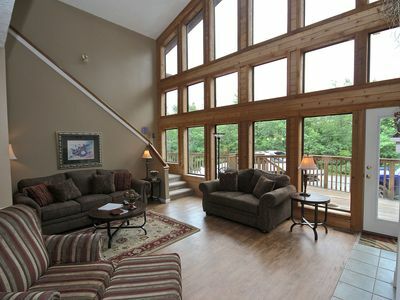 The cabin is huge, so it's the perfect place for a large family get together. 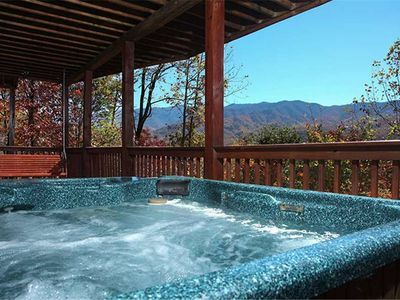 Whether it’s for a graduation in the smokies, a wedding in the mountains, an anniversary you want to share, or even just a bunch of friends who want to get away together, this big Gatlinburg cabin rental is the perfect choice for a vacation rental. 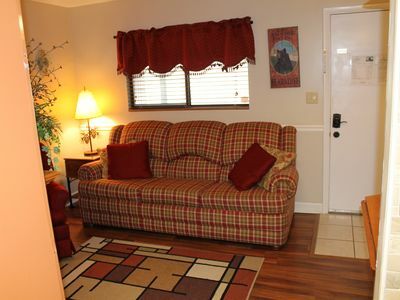 It is also a kid friendly rental in the Smokies. Eastwood has four bedrooms, three bathrooms, and sleeps up to ten guests. 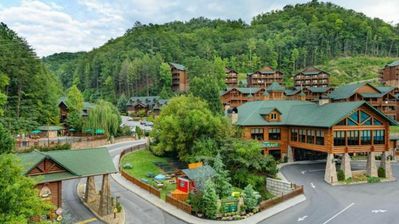 Imagine being able to take the entire family here to Gatlinburg, Tennessee! Yes, bring the kids! 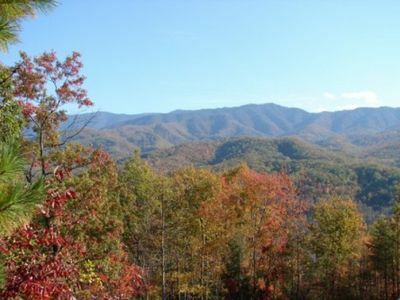 Make memories in the smokies that last a lifetime. 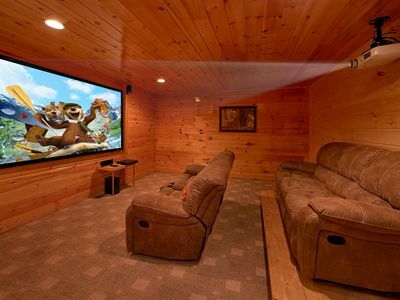 Just be prepared: once you get settled in this cabin rental in Tn., you and your children may not want to leave! 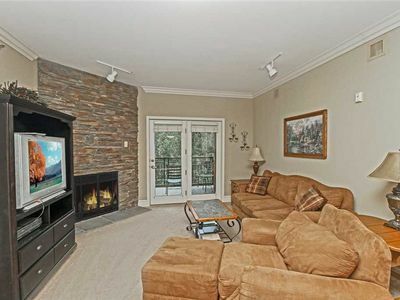 The entry level has the living area with a beautiful stacked stone wood-burning fireplace. This is absolutely perfect for relaxing and enjoying each others’ company. 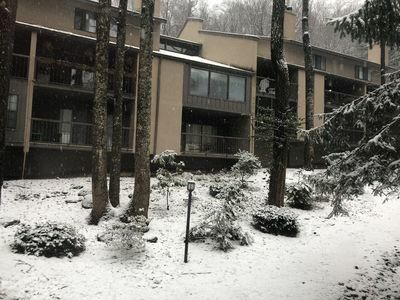 You can sit and talk about your day in the Smoky Mountains, you can read a good book, you can even take a nap in front of the fireplace to rejuvenate yourself for the rest of a fun-filled day! 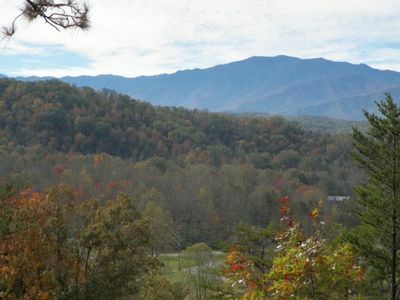 There is also a full kitchen and dining room in this large cabin in Gatlinburg. That means you can cook your own meals your own way. This works wonders if someone in your family has food allergies. You can make sure of what goes into every meal you prep. Just make sure you get some help in the kitchen! 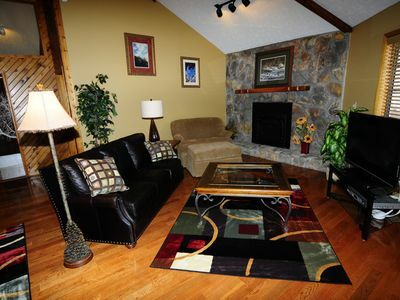 In the dining area, you can sit and talk about your day in the mountains or Gatlinburg and its many attractions. 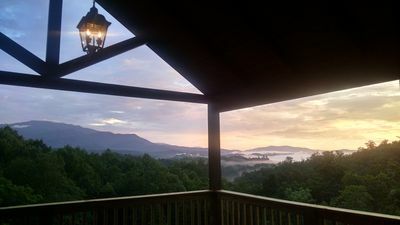 If it’s morning, plan what you’re going to do in the Smoky Mountains. 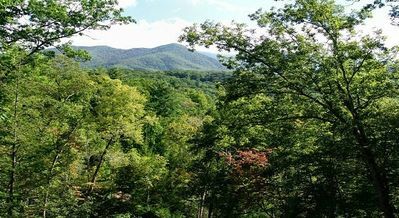 Take a hike on many of the hiking trails in Gatlinburg. If it’s evening, you can have a glass of wine and talk of your adventures at many of the activities here in the mountains. 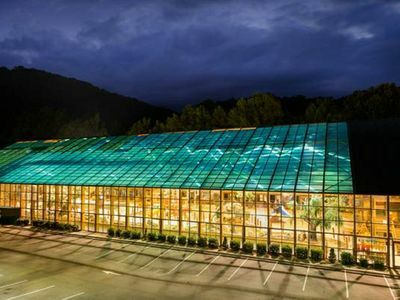 There’s so much to do here and in Pigeon Forge. 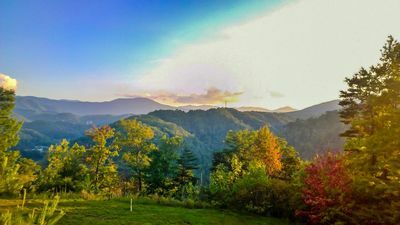 You must check out: Ober Gatlinburg, the art festivals, and of course, the beautiful mountains where you can hike, bike, ski and fish. If you enjoy eating outside, you can have your meals on the cabin's back deck. Or cook on the charcoal grill and eat at the picnic table. 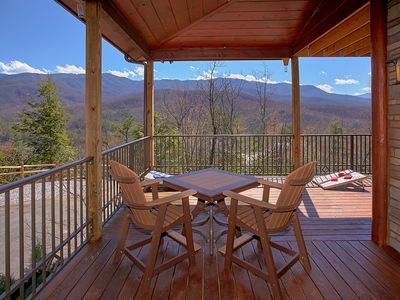 Yes, this large cabin in Gatlinburg has a picnic table. The master suite is located on the main flower and has a king sized bed and full bath which includes a whirlpool tub and a stand up shower. Upstairs is another master suite with a full bath/tub combo! If you have kids, they will love the bottom floor. This part of the cabin rental is kid friendly. Located downstairs are two bedrooms with queen beds and a full bath. There is also a game room with a pool table! Don’t forget your furry friends, as pets are welcome with a flat fee! So if you want to bring along your pets, go right ahead. There is also a sofa sleeper, tennis nearby, golf nearby, and swimming accessibility. Don’t forget the hot tub, either! It’s the perfect way to end a great day; soaking in the hot bubbles and just reminiscing about the fun times you had, and the fun times that are still to come. 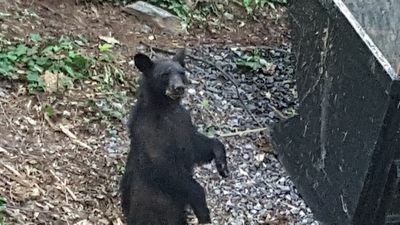 This pet friendly four bedroom cabin in Gatlinburg Tennessee will bring you the vacation in the smokies that you deserve! 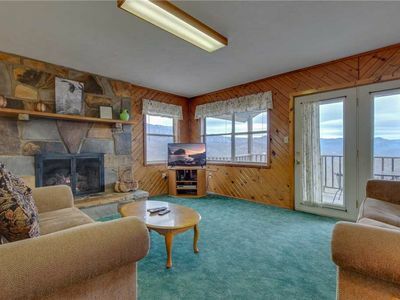 Enjoy this spacious Log 2 BR/2 B cabin in the area featuring 1820 square feet with Pool Table/Sauna.